It has been less than a month since the Samsung Galaxy S10 was announced, but the smartphone market does not stop even for a moment and the wait for the novelties of the upcoming smartphone will attract attention in the hope that something really new may surprise us. There is still a few months left until the presentation of Samsung’s next top smartphone, most likely in August to anticipate the release of the new iPhones as the Seoul company has become accustomed to. 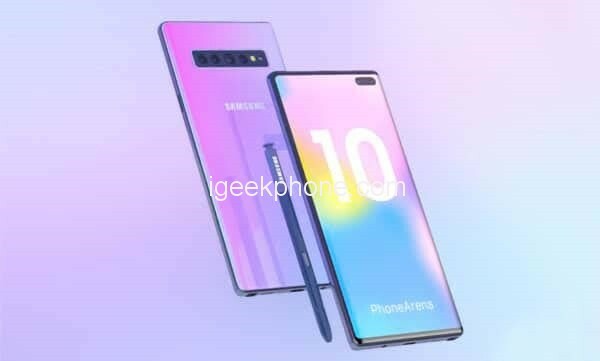 Previously it was assumed that the novelty will be named Galaxy Note 10. However, now it is reported that the phablet will most likely enter the commercial market under the name Galaxy Note X. The Galaxy S10 gives us a strong suggestion about the processor and memory specifications for Note X. It is almost certain that it will come with the Exynos 9820 / Snapdragon 855 processor, up to 1TB of memory and 12GB of RAM. It will present One UI interface on Android 9 Pie and a battery of at least 4000mAh. Will there be four sensors at the rear? It’s likely if we continue to take the Galaxy S10 5G as a reference. Most improvements will almost certainly come from the software side with only nominal improvements to the S10 camera. In the last 2 years, Samsung has announced the Galaxy Note in July or August with the actual arrival on the market after a few weeks. This means we can expect the Galaxy Note X to be in our hands during the second half of August this year. On the other hand, the release of Galaxy S10 5G and Galaxy Fold could push the release until the end of the year. One thing is certain, the price of smartphones is increasing. The recommended retail price for the Samsung Galaxy Note 9 is $1200 for the entry-level model with 128GB of storage space and 6GB of RAM. For Galaxy Note X the price will not be lower and even greater in the case of the 5G model. For the top version with 1TB of memory and 12GB of RAM, the price could exceed $2000 (current price of the S10 + variant).